Size doesn’t always matter — especially when we’re talking about a sofa with this much style and attitude. A piece this versatile works in nearly every room of the house — from the foyer to the bedroom — and steals the show with its sophisticated vibe and saturated color. This cozy nook begs for a good book and a nap. While a blue sofa doesn’t require a dark design palette, it’s totally working here. Bold, monochromatic, and seriously inviting. This modern crushed velvet sofa in dark navy is pure luxury in an equally upscale urban retreat. While the color palette in this space is mostly neutral, pattern and texture take center stage. The clean lines of an otherwise simple sofa are transformed in velvet and saturated deep blue hues. If only we all had enough living space for, not one, but TWO glamorous blue sofas! We’re loving how the colors and textures are complimentary, but these sofas are two completely different pieces, each with their own individual charm. Love! Dark blue plays like a neutral and can be paired with a myriad of colors and textures, like these varied tribal-inspired pieces with pops of pink, red, and orange. A bold electric blue sofa provides a focal point in a room with so much to distract the eye. This space feels like a scene out of our favorite Victorian-era novel — full of drama and sophistication. It’s romantic, charming, dreamy, and all about that glam old-world recamier sofa. This space is all about energy — bold, bright, and seriously fun. This sophisticated loft space is dripping with masculine style, complete with an Eames-style lounge chair, industrial accents, and a bold blue jewel-toned sofa. 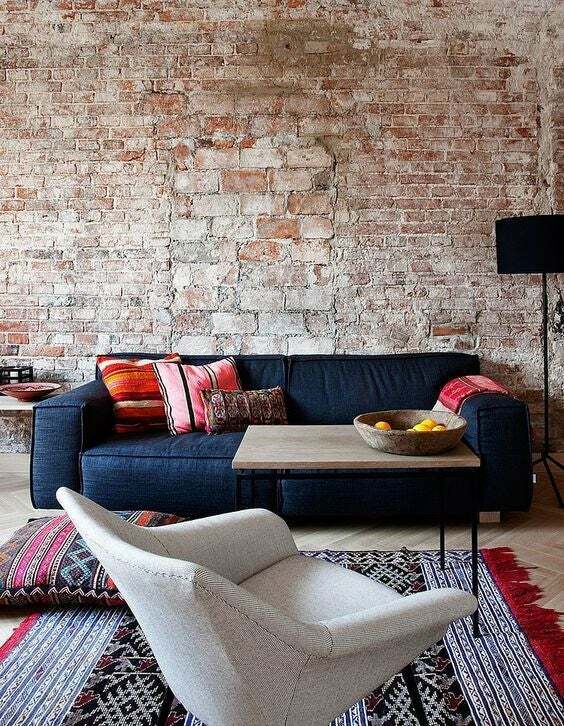 The beauty of this room is in its simplicity, and absolutely everything is minimal-design perfection.